One of Memtimin Hoshur’s longer short stories, This Is Not A Dream (بۇ چۈش ئەمەس), could be described as a romantic tragedy. The story was turned into a movie by director Shirzat Yaqup, with music by Mexmut Sulayman (currently one of the coaches on the The Voice of the Silk Road). My translation of This Is Not A Dream will hopefully be published in the near future. In the meantime, here is the beginning of the story. That night everyone saw the fire that suddenly appeared on the hill above the village. At first, it seemed that the wind was bringing the smell of burning cinders. After that, spectacular flames rose into the air and lit up the surroundings. Terrified people came out onto the street, shouting. Horrified women were screaming. _ Hey women, what are you screeching about? It’s not as though your mother is dying. It’s that Tohtek’s house burning, Tohtek’s house! _ Someone galloped his horse back down from the hill, yelling as he cut straight through the middle of the crowd. _ Have you heard? Tohti’s house is burning! _ It was an amazing house eh…! _ Poor thing, with such hardships he built it too! As soon as Tohti came out onto the landing, all three of them rushed at him and began to give him a severe beating. Although Tohti was a match for every one of them, he didn’t fight back. Nor did he fall from the blows of their fists which rained down on him. When they had gotten to the point of punching him as though he were not a person at all but a wooden post, insensitive to suffering and pain, for some reason they suddenly stopped. Blood flowing from a split above Tohti’s eye ran down his cheek and dripped onto his shirt. _ Ptooey! Dog, get away from here! _ Did you think to yourself that we would give you a girl? _ Wherever you came from, get a wife from there too! But Tohti remained silent. His eyes were staring off into the distance. Above the clouds gathered on the dim horizon, the sinking sun’s last reddish rays were flashing; the moon too had appeared in the sky. But it was a different group of scenes that passed before Tohti’s eyes. By the time Tohti had gathered himself again, Gulshen’s brothers were gone. He could scarcely control the crying which burst from the very depths of his being. The humiliation tormented him, as though it was lighting a fire in his heart. Was this anger? Regret? Grief? Or the conscience’s desire for revenge? He himself didn’t know. Only a few evenings previously Tohti had met secretly with Gulshen. _ I’m scared! Will I never again come back to this village? My brothers, my relatives… how would I ever look them in the face…? From then on, Gulshen’s brothers kept her locked up in their storehouse. On the door swung a great, rusted-out lock that couldn’t be opened without at least half an hour of fiddling. The faithful girl who had run away blushing after kissing him on the cheek for the very first time… who had given him those furtive looks… who had exchanged whispers with him on moonlit nights…, was nothing like today’s dejected and fearful Gulshen. Tohti was not afraid of the sky falling down, or of the opposition all those people who had no understanding of the human heart. It was just those nagging doubts – Will Gulshen weaken her resolve? Will she go back on her promise? – that were pushing him into despair. Memtimin Hoshur has been writing stories for more than five decades and it is no surprise to find works of very different kinds in his corpus. This story was written in 1961, in a period of intense socialist construction in China, complete with radical labels and slogans. The political background weighs heavily upon this story, effectively turning it into a propaganda piece. It is impossible to imagine Hoshur writing such a story today. Yet, for all that, the tale still manages to be somewhat surprising. 1. The name of the female protagonist, Güli, means “flower. 2. “Iron Girls” refers to a movement of state feminism which was designed to liberate women by engaging them in the means of production. Do you remember? This was the conversation we had last spring. We were talking by a canal with lush green pasture land on either side. Beside us lay a road that stretched away into the far distance. It was there that I shyly confessed my love for you. “Fine, I will do whatever you wish. Go ahead and test me,” I said, before setting off hurriedly down the road. When I looked back at you after firing up my tractor, you were waving goodbye with your handkerchief. My tractor, too, put-putted as if to say “Bye bye! Bye bye!” as I drove away. Later that spring, the day I came back from completing the task of helping the neighbouring villages, I invited you to the mountainside above our village. I really love standing up on the heights and looking down over our beloved village. When a gentle spring breeze brushes your face as you gaze into the distance, you feel as though your chest is going to burst, it is filled with such vigour. Looking at the waves of grain in serried rows of wheat fields billowing like the sea, the whitewashed new houses of the village residents dotting their respective orchards and gardens, the channels of water stretching into the distance like threads of silver, you can’t help wanting to burst into song. You did not come that day. If you had come, we would have enjoyed the springtime scenery in our new village together. I would have regaled you with stories of the successes I achieved during my days of labour. “Come on, how could you invite me to such a faraway place?” was your reply. I had hoped that you would come and challenge the others with a, “Hey, let’s see who finishes first?”, and become one of those “Iron Girls” singing as they worked their way down the rows of wheat. If you had come, we would have sung the songs of the farming folk together; If you had come, we would have shown everyone our labouring skills; If you had come, we would have drunk from cool spring water together after work, and talked about this year’s bumper harvest as we walked home. “Güli, why didn’t you come?” I asked you later. The bountiful season of autumn. Our village had successfully finished the harvest and everyone had been given the day off. Nature had taken on a golden colour, while, after the autumn ploughing and sewing, the fields had assumed yet another hue. But it was not to the fields that I invited you. Rather, it was to pleasant orchards filled with the sweet scent of fruit. But when I passed the fields and came to the production group’s great apple orchard, I was taken by surprise. Young people clutching baskets were making their way into the orchard. “Hey, what’s going on? Today is a rest day isn’t it?” I asked the “Iron Girls” I saw there. Not long after, the first signs of the storm were upon us. But we beat the storm with our frenetic apple-picking efforts. By the time it hit with full force, the apples had all been brought in. In this battle with nature, a plentiful harvest had been saved. I didn’t even have time that day to notice whether you had come or not. Perhaps, if you had come, you would have made yourself busy with the group of girls picking apples. The last time I invited you out was on a freezing winter’s day. Nature had been covered with a cloak of pure white, and even the ice was cracking in the intense cold. Trees were weighed down with brilliant white blossoms of hoarfrost, their branches sagging. The winter air created fantastic patterns on window panes. In the village schoolyard, lively children were throwing snowballs at each other. Girls with cheeks as red as pomegranates were bringing water up from the fog-shrouded springs below the village. Their laughs resounded in the cold air, echoing even in the far distance. “See, it may be winter outside, but in their hearts it is spring!” I couldn’t help blurting out. Again you did not come. Sadly, you didn’t come. Maybe you just didn’t feel like going out into the cold of that day. But, Güli, don’t wait for me. You should understand that I was also testing you. Whenever I envisioned your slender form and your moon-like features, I would think to myself, “If only such a beautiful flower would embrace with passion the ups and downs of life, how much more beautifully would it bloom?” But not even once did I see you with a fire for real life. But now I know. You are not a proud mountain wildflower blossoming eternally on the snowy peaks; you are a potted flower sitting behind a window, witnessing nothing but the dim light of the sun. Asterix translator Anthea Bell on literary translators. One language is not enough for bookworms. If you want to read books in the original, ironically enough you qualify yourself to be a translator. There are in fact no special qualifications. I feel upset when young people write to me saying they’ve never done a post-graduate course in translation theory; can they still become translators? Translation theory is probably fun in its way, but I have never met a publisher who cared in the least whether you knew anything about it. This simple but moving story consists solely of a series of short dialogues between a son and his father, who is taking him from his mother and the traditional rural Uyghur lifestyle to live with a new mother in the strange world of the big city. The emotional and psychological impact on the boy is conveyed through series of questions he asks his father as he attempts to make sense of what is happening. This is a poignant insight into the personal and cultural alienation that can result from family breakdown and urbanization. – Dad, where were you when I was little? – I was in a city far away, studying. – Dad, why are you taking me to the city? – From now on you will be living with me in the city. – Why isn’t my mum coming with us? – I got a divorce from your mother. I need to have one of my children with me, son! But we are not bringing your mother to the city. – Dad, is the city far away? – Yes it is. We’re going to go by motor vehicle. – Am I going to ride in a motor vehicle too? – Yes, you are going to ride in a motor vehicle too, my son. – Dad, is this the city? – Yes, we have arrived in the city. – Why are there so many people in the streets? – In the city there are a lot of people. – Hey, what kind of motor vehicle is that? – Why are those houses so tall? – Houses in the city are all that tall. The place we are going to live in is just as tall. – Dad, when you go to work, am I going to be afraid? – Why would you be afraid? I am going to bring you a beautiful new mother. – Why do you keep opening the window and looking outside. Haven’t you had enough of looking at the city? – Dad, why aren’t there any hills to run around and play on here? – There wouldn’t be any hills in the city. – Dad, why aren’t there any canals to swim in, or any springs where kids can lie on their tummies to drink the water? – Silly! What would springs be doing in the city? – Why aren’t there any cows leading their calves around? – Cows don’t walk around the streets of city. – What about sheep with their lambs? – Sheep don’t walk around here either. – Dad, why don’t you sleep beside me anymore? – You are a big boy now, you will sleep separately in this room. – Dad, why does my new mother rub paint on her lips? – Don’t ask stupid questions. – Civilized city kids call their mothers “Aunt.” It would be good if you called me “Uncle” too. – Dad, why don’t you bring my own mother here? – When you were away from home my mum would always say to us, “Your father is a good man.” My older brother never stopped talking about how you would pick him up and play with him. Whenever they spoke about you, I would wonder what you were like. – So, what is your dad like? – You miss your mother don’t you? – Yes, I miss her. Every morning when mum would get up and stoke the fire to make breakfast, I would roll over into her place. Her quilt was still warm. I don’t know how many times I thought, “If only my dad was home too, how wonderful it would be to lie between mum and dad, and then roll into mum’s arms and then dad’s arms again and again.” Oh dad, please dad! If you just take me back to my own mother, I will run to her calling out “mum!”, and throw myself into her arms. In a previous post I wrote about the latest candidate for longest word in the Uyghur language. In that post we saw that agglutinative languages like Uyghur can produce extremely long words. Another feature of such languages is the sheer number verbs forms that can be produced. Mood, voice, aspect, tense person and number are all conveyed by suffixes which must be attached to the root verb in the appropriate order. Recently Alim Ahat, founder of Uighursoft, wrote an article suggesting that Uyghur may have a store of some 50 million words when you include all the possible forms of every verb. Alim was working on a new edition of Uighursoft’s spell-checker when he took the opportunity to carry out some mathematical analysis of Uyghur verb inflections. By his calculations, the total number of possible verb forms in modern literary Uyghur is 8,455. When he ran that by all available verbs in his software he came up with a store of an astonishing 42,613,200 synthetic words! Alim says that no matter what form of what verb you write, his spell-checker will find it 99.99% of the time, and the total number of words and expressions stored in his software tool approaches 50 million. Perhaps most astonishing of all is that as I look down the list I am yet to see a form that I do not recognize as a possible form of the word. In other words, a person who knows the language could (in theory) form and use any of these words. It seem the human brain is indeed “hard-wired” for language (Chomsky?) and has an amazing capacity to synthesize language according to the “rules”. How long can one word be? One of the fun little sidelines that come with learning an agglutinative language like Uyghur is competing to find the longest possible word. Things that need a whole sentence to say in English can be expressed in Uyghur with one long word. I remember talking some years ago with a linguist who was studying the Kyrgyz language. Kyrgyz morphological rules are so utterly strict and consistent that he was able to devise a computer program to produce for him the longest possible word in Kyrgyz. (He never told me the actual word and I am afraid I do not remember how many syllables it had.) In any case, once ha had the word, the next question was: Is this word a real part of the living Kyrgyz lexicon or is it purely hypothetical? To find the answer, the linguist went to a remote part of Kyrgyzstan and sought out and elderly Kyrgyz man. He presented a scenario involving a certain person carrying out a certain action in a certain way in a certain context, and so on. He then asked how this man would sum up the situation in his own words. Sure enough, so the linguist claimed, this senior Kyrgyz spontaneously used the very same word the computer had come up with. Uyghur has some features that would make it harder to program than Kyrgyz. Nevertheless, the search is always on for the longest word. Recently I came across a contender that was put forward with the offer of a prize to anyone who could beat it. The word consists of 47 letters and 18 syllables. I am not convinced that the construction “-mayliwat-” is valid. If we reduce it to “-maywat-” then the word looks correct to me. Even then, this word still weighs in at a respectable 17 syllables. So, what does the word actually mean? I dunno, maybe it’s because you all are unable to bring them together. If you are wanting to study the Uyghur language, nothing beats spending time in the Xinjiang Uyghur Autonomous Region of China. It isn’t that the language schools are great – you may be lucky enough to get one of the better teachers but the overall teaching quality is not high, and none of the programs lead to any kind of certification. It is, of course, the immersion exp erience that would be the biggest boon to your Uyghur language learning. However, if you cannot make it to Xinjiang but are fortunate enough to be able to study in the USA, there are some options. Here is a brief introduction to the handful of universities offering courses in Uyghur, listed in no particular order. An undergraduate program with three levels of Uyghur language study is offered through the Department of Central Eurasian Studies. IU also hosts the Center for Languages of the Central Asia Region (CeLCAR), which offers Uyghur language learning material online as well as distance and intensive courses. KU’s Uyghur program is offered by its department of East Asian Language and Cultures. This university has also published what is widely regarded as the best first-year Uyghur textbook and grammar, Greetings from the Teklimakan: a Handbook of Modern Uyghur, by Tarjei Engesæth, Mahire Yakup and Adrienne Dwyer, which is available for download at no cost here. This university has a fairly comprehensive Turkic department, including elementary, intermediate and advanced Uyghur courses. The courses in comparative grammar of Turkic languages look really interesting too. If you have an historical bent you can even study Old Uyghur! If you have always wanted to be able to put Harvard on your CV, you could try taking the Uyghur courses at the Department of East Asian Languages and Civilizations. An 8-week intensive summer program with first- and second-year Uyghur instruction is run by the Center for Russia, East Europe and Central Asia (CREECA) providing there are a sufficient number of enrollments. Is there anywhere else to study Uyghur in the English language? To date I have not found any information about courses being offered in other English-speaking countries. Please leave a comment or contact me if you know of any. Note: If you want to type in Uyghur-Arabic script, click here to see the standard keyboard. 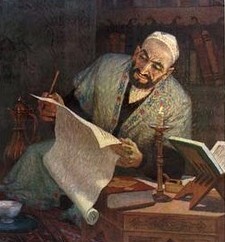 Of the numerous scripts that have been used throughout the history of the development of the Uyghur language, three of them are in use today – the Arabic script, the Cyrillic script, and the Latin script. 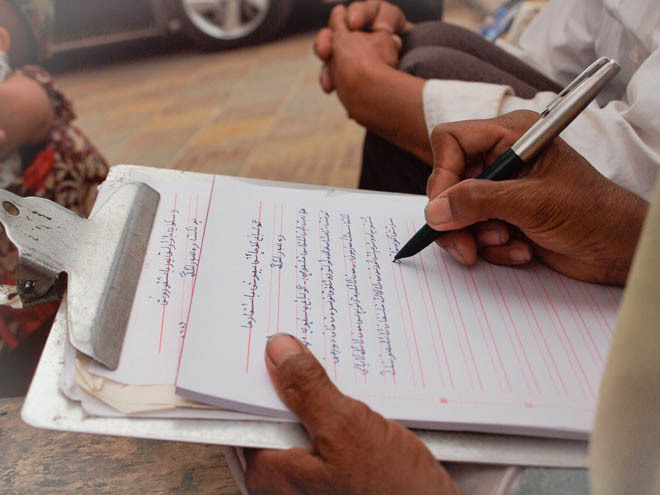 The vast majority of Uyghurs today use the Arabic script, called Kona Yeziq (“Old Script”). This is the official script for Uyghur in the People’s Republic of China, and can be seen, for example, on Chinese currency (along with Chinese, Tibetan, Mongolian and Zhuang). 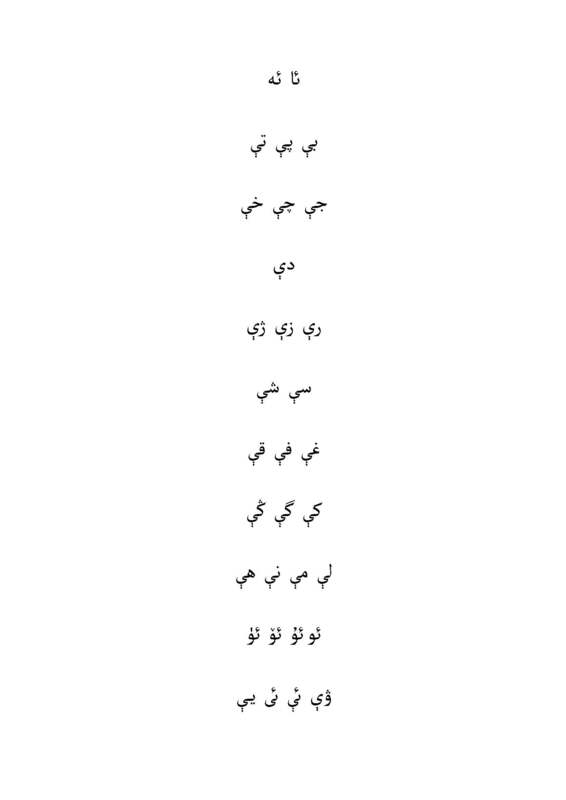 For the beginner who has no background with Arabic-based scripts, learning the Uyghur Arabic script can appear quite daunting. Especially when you discover that most letters take different forms depending on their position in a given word! However, there is a certain aesthetic and logic to the Arabic alphabet and it should take no longer than a week or two to become fairly familiar with it. One thing I found very helpful in learning both the letters and the order of the alphabet was to understand that letters with the same basic shapes are grouped together. So, for example ت ,پ ,ب appear together and in that order in the alphabet. The image below (click to enlarge) shows how this works for the entire alphabet. Read from left-to-right and top-to-bottom. You will see that most letters have an ې added, which simply indicates the pronunciation of that letter. It also means that you are seeing the word-initial form of each letter.